In other words, in a refreshing change from recent history, the content owner was able to present Amazon with a “take it or leave it” proposition. They decided to “take it”. They were wise. The game was changing either way. All of this will happen despite, or perhaps because of the fact that, the actual slice of value captured by each player changes in size and shape. Publishers will be forced to cede more revenue to authors, the idea that 25% Net is a defensible long-term ebook royalty rate is a farce best forgotten about quickly. E-books will push this change even more. There is no reason why authors’ royalties should be the same on e-books as they are for paper books and in many ways there is no reason why the authors cannot sell e-books themselves rather than through a publisher. Why should you sell a paper publisher your digital rights when there is no need? 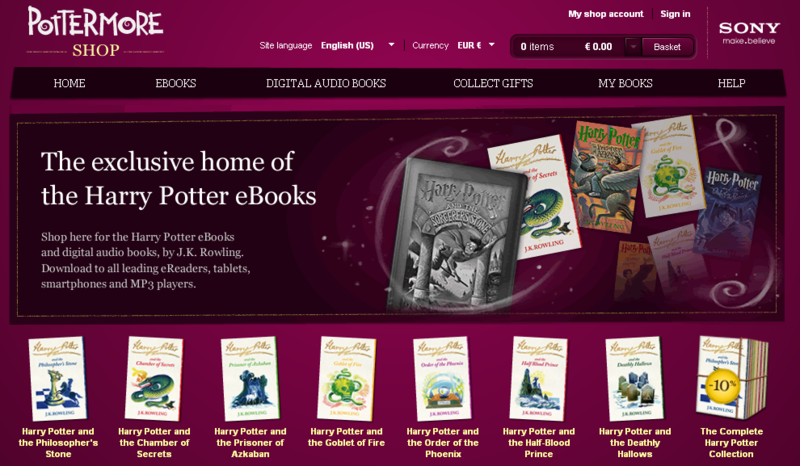 I think Mike is right to say that Pottermore marks a decisive point of change. It is the point at which owning the brand becomes essential, the point at which the 25% slice for the author stops being enough and the changed power balance between author and publisher begins to bite really hard. If publishers hope to use author brand and scale to attract readers direct then they need to persuade the authors to work with them. That’s gonna take money and a whole new approach to working with the author. I expect we’ll see more of that. The other change I believe it will drive even further is that of Niche or community driven content publishing. If selling without DRM enables big publishers to flourish as retailers (or for that matter niche publishers with scale in a single niche), then there is even more incentive for them to pull readers together in communities of interest (or rather to build stores that appeal to those existing communities of interest) and sell content to them directly rather than spending all their marketing on pulling them to a mass appeal site that only offers them content that works for that reader by chance event or a well placed cookie! So I see Niche coming back with a vengeance, and community at its side, perhaps even a third horseman in the shape of an industry newly engaged in open standards, weak DRM and a willingness to innovate. That’s rather exciting if you ask me. Well put, Eoin. And it’s rather exciting indeed. I’m interested in where you see new authors fitting into this scheme. Thing is, J K Rowling can do what she likes, with or without a publisher. But there’s only one J K Rowling in this world. Where publishers really fail authors is on the mid-list, those poor suckers who have to do all their publicity and marketing themselves, despite having the backing of a relatively big business. Breakthrough authors don’t necessarily get much joy either. But if those groups choose the ebook self-publishing route, they simply join a huge ocean of ebooks out there that have, as yet, no easy ways of reaching their target readers, or of distinguishing individual names from the pack. My concern is that these changes will simply benefit the tiny percentage of extremely well known authors (and maybe the fantasy writers who clearly have a niche) who would have done pretty well for themselves in the old system, too. I, sadly, think you are right, while on the one hand power will shift for authors, the vista in terms of making a living from writing is increasingly a negative one. Most writers already don’t sustain themselves through writing and this will get worse in a digital age. The winners though will continue to grow in my view. So the rewards of success will be greater, even if fewer authors actually climb that high! You might not be surprised to hear that I’m a good deal more optimistic about the general outlook *for authors* – particularly those who choose to self-publish at least some of their work. This self-publishing revolution runs a lot deeper and wider than most people imagine. When I was finalizing Let’s Get Digital in July last year, I made a last-minute decision to include contributions from 33 successful self-publishers (outside the usual names of Hocking, Konrath, and Locke). All of these guys were selling over 1,000 books a month (most at higher prices than 99c) and some were selling over 1,000 books a day. Just two short months later, I was perusing the new “Top 100 Indie” list that Amazon had broken out from the main listings. I noticed two things. First, #100 on that list was approximately #400 in the overall Kindle Store, and given that the Kindle Store also includes magazines, newspapers, and games, it was clear that *at least* a quarter of the top-selling e-books on Amazon came from self-publishers. The second thing I notice was that most of the names were unfamiliar to me (I had researched the top-sellers quite intensively just two months before). I have been tracking that Top 100 indie list on and off, and that proportion certainly wasn’t a blip. It’s relatively consistent. Furthermore, if you get a little more granular, and dig into the genre bestseller lists, the proportion of the charts that self-publishers have captured grows at a staggering rate – in direct relation to whether that genre went digital first or not (i.e. Romance, Thriller, SF/Fantasy have high proportions of self-publishers on the lists, but non-fiction/literary/historicals less so). I’m a regular on Kindle Boards, and participate in several self-publisher mailing lists and Facebook groups. New names are making a run at the charts all the time, and collecting tons of readers and making a lot of money in the process. I also see self-publishers who started around the same time as me (about a year ago), now raising their prices to $3.99 and $4.99 – and holding their own. A lot of what is going on in the community isn’t that visible to the outside, and our numbers won’t appear anywhere like the AAP surveys. But I know lots and lots of peopel with several titles out that never trouble the top of the bestseller lists, but are making excellent sales (and money) with books ranked at 5,000 or so. I see more and more writers sustaining themselves in this digital age, and I think that number will only grow as the US market continues to expand, and new markets open up internationally. There’s only one JK Rowling. And the books when linked to Amazon, B&N, etc, are not DRM-free. As for the DRM issue, I still think it’s an important move away from a strong system, if not as far forward as it seemed yesterday.